ONCHAN, Isle of Man – August 15, 2018 – PokerStars Play has become the first social gaming mobile app to launch live poker and casino with the addition of two adrenaline-fuelled live play money games, War of Bets and Bet on Poker. 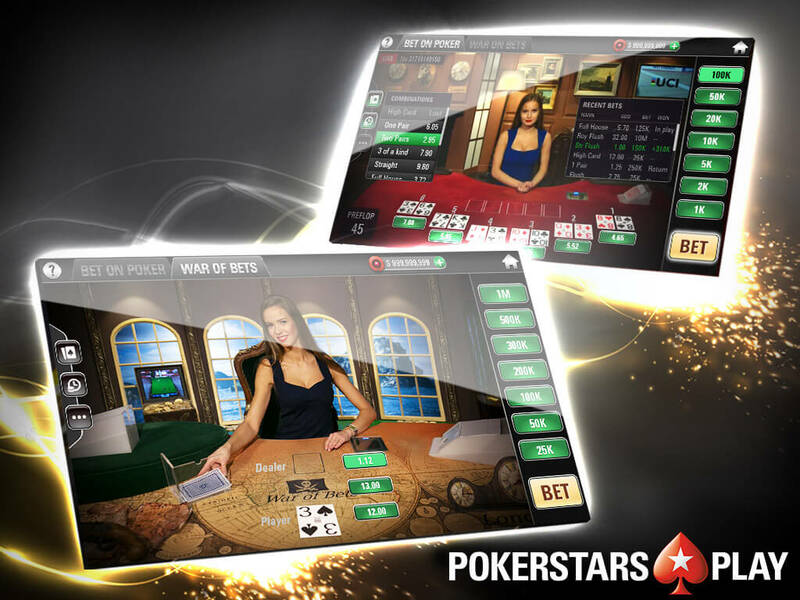 The play money games, provided to PokerStars Play by BetGames.TV, are unique in the social poker and casino landscape and offer live presenters, an enhanced user experience and optimised gameplay for mobile devices. In War of Bets, players and the live dealer go head-to-head to see who is dealt the highest value card. In various betting rounds, the player must decide whether their card or the dealer’s card will be the highest. Additional bets can be placed on the colour, suit and value of the cards. Here, the live dealer deals 12 cards, face-up, to six positions. Like Texas Hold’em, the five community cards are also dealt face up and combined with the six sets of hole cards to create the best five card combination. The goal of the game is for players to predict and bet on which of the six positions will win. Additional bets can be placed on what the winning combination of cards may be. PokerStars Play offers poker, casino and betting fans a cohesive gaming experience that epitomises the variety and fun on offer at PokerStars. Games include Texas Hold’em, Spin and Go Texas Hold’em, Omaha, and casino-style slots. Both War of Bets and Bet on Poker are available on the PokerStars Play app, which is downloadable from the App Store and Google Play Store. BetGames.tv is a market leading developer and distributor of its own video-streamed live games. Their solutions are considered highly reliable and are used in online and land-based companies throughout the world. BetGames.tv combines traditional betting with popular lotteries and table games while offering a superior level of quality with unique content that defines players’ gaming experiences.